In this classic Top Gear clip, Richard Hammond takes a spin around the track in Fernando Alonso’s world championship winning Renault. The car is from the V10 era, when the Formula One cars were pushing almost 1,000 horsepower. Not only does it have an insane amount of horsepower, it also has some the of most technologically-advanced auto parts in the world. This video demonstrates how difficult it is to control these immensely powerful vehicles. The professionals sure make it look easy. And, if you’ve never heard a Formula One engine’s rendition of God Save the Queen, here is your chance (end of the clip). The Singapore Grand Prix venue has won the award for Motor Sport Facility of the Year. The award was announced November 11 at the annual Motor Sport World awards in Cologne, Germany. 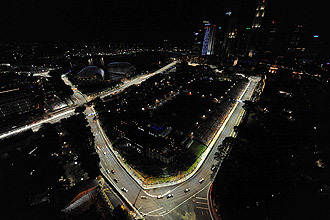 The 5.067km track was praised for the way the track was integrated through the center of the city and for successfully holding the first F1 race at night under the lights. Runners-up for the award included the European Grand Prix in Valenica, the Toyota Racing Development chassis engineering building in Cologne and a new racing facility at Sturup in Sweden. Fernando Alonso won the event for Renault, Rosberg obtained a rare podium finish in 2nd for Williams, and eventual World-Champion Lewis Hamiliton took 3rd for McLaren.